So excited to have Your Cloud Parade here today sharing this yarn art DIY. Your Cloud Parade is an online wedding marketplace chalk full of goods and services to fulfill your every wedding (or party!) need! And today, they partnered up with Typologie & Co. to share this simple DIY that can add that special statement to your event…..and later, your wall! 2. Hammer nails into into plywood following the traced pattern & continue until completed. 3. Choose yarn color and securely tie one end of the yarn to a nail and then start wrapping the yarn around each nail until completed. Voila! Done! Thanks again Your Cloud Parade! Be sure to check out their shop to discover more fabulous products and decor! Obsessed with this dress that I got from Wasteland a few weeks ago. It’s made by Knot Sisters…and I’ve kind of fallen in love with their whole collection! It has the perfect dropped hem and is a great transition piece into fall. This little white dress is calling my name too. Honestly, a mini dress and boots…it’s the easiest no-fail outfit combo. Throw on some tights and a sweater and you’re ready for fall. Officially my little 2 year old. Still getting used to that! Despite the challenges that come with this age (hello sass) I think it might be my favorite. I guess I keep saying that the older she gets, but it’s true. I love her curiosity and desire to explore and discover new things. And I love that we are able to “chat” now. Her cute little voice and inflection on words are so funny. I am trying to capture as much of it on film as I can, because I know her baby voice won’t last long. It’s been a tough week for me, and I am thankful to have her to make me smile regardless of whatever circumstances arise. Here it is folks…my first ever group giveaway. And it’s a big one. I’ve collaborated with a group of fabulous bloggers to bring FOUR very lucky readers a chance to win $250 USD each! We hope this will help you get a head start on adding fabulous fall items into your closet! Terms & Conditions of Entry – This giveaway is open worldwide to people aged 18 year and over. It will run from 8/26 to 9/2 midnight MST. Once the giveaway closes. the winners will be announced on this Rafflecopter and also contacted via email. To claim your prize, please respond to the email within 24 hours, failure to do so will result in a re-draw. Once the winners have been selected, this decision is final and no further correspondence will be entered into regarding this matter. 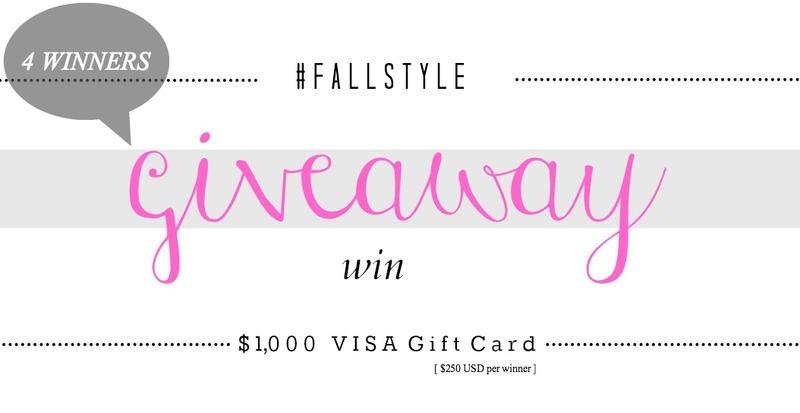 This giveaway is in no way affiliated with Visa or any other social media platform. Good luck! I partnered up with Lookbook.nu and Levi’s for the launch of the new Levi’s Revel : a revolution in shaping jeans. I’ve always been a fan of Levi’s for their classic, timeless denim…but these jeans definitely take it to the next level. They have just the right amount of stretch without sacrificing quality. They fit like a glove and are comfortable to top it off. Revel, you win. Any fun weekend plans? This NEVER happens but we’ve got the whole weekend free…..and I plan on taking full advantage! The weather’s been so nice, I think we might have to beach it. TGIF friends.